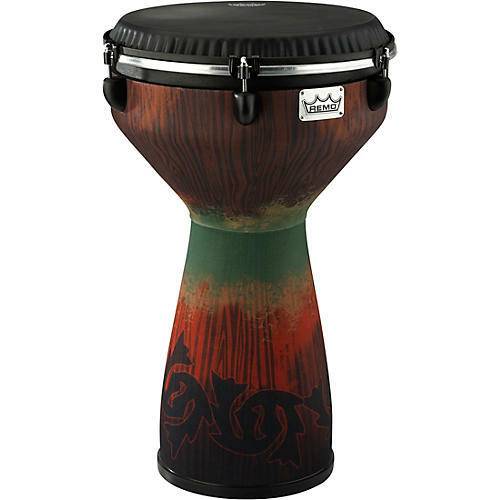 The Flareout™ Djembe offers increased bass and slap tones with a unique flared out drum shell design for exceptional projection. Manufactured with an ACOUSTICON® drum shell flared out body design featuring a high density impact rubber base protector, a weather resistant, Black Suede™ drum head, and a Contour Key-Tuned system for comfort, easy to tune and replace drum head. This beautifully designed drum features three DESIGNER’S TOUCH fabric finishes that create an exciting blend of style and sound for this Remo Original. One year warranty on heads. 5 year warranty on hardware and practice sets. Warranty terms vary. Check with manufacturer for specific product warranty.